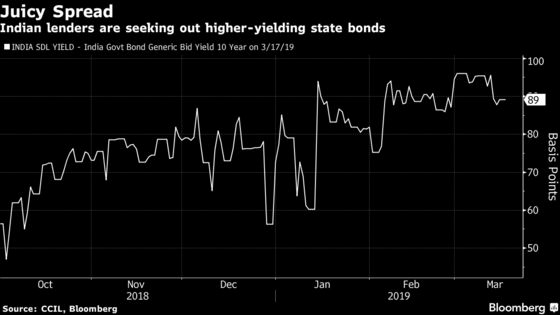 (Bloomberg) -- Selling Indian government bonds and buying high-yielding paper issued by the nation’s states is a favorite trade among the biggest holders of sovereign debt right now. The strategy is offering lenders extra returns of about 100 basis points at a time when concerns about an oversupply from the federal government’s record borrowing plan has damped the appeal of sovereign securities, according to ICICI Securities Primary Dealership Ltd. and Deutsche Bank AG. “Most of the banking system is replacing sovereign debt with state-development loans or credit,” said Srinivas Varadarajan, treasury head at the Indian unit of Deutsche Bank. India’s $807 billion sovereign-debt market is battling poor demand and increased volatility ahead of the upcoming national vote. Underwriters have rescued bond sales twice since January as the government’s plan to borrow $100 billion in the year starting April 1 and a slowdown in buybacks of the securities by the central bank damps appetite. That dynamic doesn’t apply to the nation’s states, some of whom recently borrowed funds at about 8.4 percent, richer than the 7.39 percent yield on the 10-year federal paper sold at the most recent auctions. “It makes sense to sell a government bond at 7.5 percent and buy a state development loan at 8.2-8.3 percent, or give the money out as a loan,” Mumbai-based Varadarajan said. Banks are buying state bonds and moving them to the so-called held-to-maturity group, a category that shields them from price swings. Central bank rules allow lenders to shift their holdings between three buckets -- held-to-maturity, available-for-sale and held-for-trading -- before the start of the new fiscal year on April 1.